Not much to talk about today other than work, which continues to be busy. We have landed a couple of new project that require us to hire some new people (always a challenging task, especially here). Daily life is what continues to fascinate me. 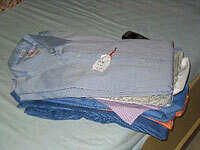 I got back my first load of laundry last week. Although my mother at an early age did a good job with laundry and my old roommate would sometimes fold my clothes, I have to say I enjoy the service here. Having everything done for you does not come without a cost. First of all, not everything comes back, and sometimes you get someone else’s clothes. Secondly, everything gets tagged which requires a hole to be punched in all your clothes. This hole is not reused–the next week a new hole is punched. While the holes themselves are small, I expect most of my clothes to be left in Mumbai at the end of the year. I have not seen the cleaning process but it is supposed to be quite amazing. Sunday was spent touring Bombay. We walked around the Gateway of India, built to commemorate the visit of King George V and Queen Mary to Bombay. Then we went to get some good bargains. I decided to buy a 1914 brass compass build by the Brinton Compass company. This would have been great if there was such a thing as “Brinton Compass,” it is actually the “Brunton Compass” and the one I have was build in India, not England, in 2001. Oh well, lesson learned. Sunday night my roommate and I avoided our apartment while 15 guys from the office watched India get crushed by Australia in cricket. Needless to say they left rather disappointed. I have come to terms with the general idea that nothing is the same in Bombay as in the rest of the world. Saturday was the day I had been looking forward to. Getting out on the water, having a couple of races, drinking some beer and enjoying time away from the office. Although I enjoyed the day immensely, it was not the same as a day back at Fishing Bay. The best way to explain the differences is to just go step by step through the day. Prior to leaving the club, there was the typical amount of confusion, “Where is my crew?”, “Where is my boat owner?”, “Do we have water?”, “How many races?” etc…, but this is where most of the similarities stop. First of all, I didn’t have to run to the store for my bottle of water, I purchased it for 10 rupees (20 cents) at the club. 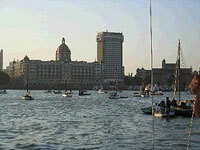 After getting all my needed supplies, we walked over to the Gateway of India to be taken out to our boat in the launch. Stepping on the boat I was a little nervous, I figured the J-24 would be in horrible condition. What I forgot is that it cost next to nothing to have someone take care of your boat full time. The deck was spotless and down below looked like it was right out of the box (no mold, no pool of water, no smell of stale beer and two-year old bag of chips). The sails (softer than my bed sheets) were already on the deck, everything was rigged up, and we were ready to go sailing. Racing would include six five-leg races on a triangle course with the longest leg taking no more than ten minutes, each race was over in thirty minutes. With only three J-24s on the line the starting strategy was simple stay away from the other two boats who decided they would rather match race each other. The other three guys on the boat had not sailed together very often so crew work left a little to be desired. I worked the fore deck which kept me away from what I figured would be the yelling in the back of the boat. This didn’t happen. Confrontation is not a big thing with Indians, so even when we hit someone or someone hit us, very little was said and no protest flags were flown; everyone just did their turns without saying a word. It was strangely civilized. We had a good day of racing with one 1st, three 2nds, and two 3rds. Lunch was not on the boat and I figured that I would just go hungry. I was use to not having much food on a boat so this was not a big deal. But after the third race, we were approach by the lunch boat that gave us our sandwiches and drinks. After racing I started to make up lines and roll sails, but was told to wait until we had the boat boy help us. After a day of sailing in the hot sun, I was excited to relax at the club and have a couple of cold King Fishers (a popular Indian beer). This did not happen. We had finger sandwiches and tea. Again very civilized compared to my States-side sailing experiences, but something I think I will work on changing over the next year. The awards ceremony was put on hold until Monday night because racing and the Sunday night party had to be cancelled due to the World Cup Cricket match. Overall it was a great day on the water, with great people. Prior to departing for India, I had resolved that the War in Iraq was the last thing I wanted to discuss. Not that I was tired of hearing about it, or that I did not care, but I felt that it was a conversation that would cause tension with my host and colleagues. I have done my best to hold to this principal. Back in Washington [D.C.], you get tired of everyone talking about the last “happening,” be it the latest election or the president’s actions. While it is enlightening to watch current events from the other side of the world as a minority in a foreign country, I will say, I miss the opportunity to debate and argue. Most people here have been interested in my thoughts on the Iraq situation, and on the U.S. in general, but I continue to avoid heated discussions. I look forward to learning from living abroad during this period in time. “And although my opinion is not any more valuable or relevant merely because I am an actor, that fact does not render it unimportant. Some have suggested otherwise, trying to denigrate the validity of this opinion and those of my colleagues solely due to our celebrity status. This is insulting not only to us but to other people of conscience who love their country enough to risk its wrath by going against the grain of powerful government policy. I feel that Sheen is misguided in why his opinions are broadcast around the world. It is not because he is a voice for the voiceless, but solely because he is an actor who plays the role of the president of the United States on television. The voiceless do have a voice, it is called a vote. Sheen was not elected by the “voiceless” to speak for them, he was given a pulpit it speak because he is an actor on a highly rated television show. Just my thoughts…I will return to telling stories of the culture and of places I see. 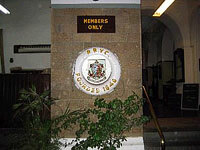 Tonight I am having drinks at the Bombay Royal Yacht Club with the commodore, hopefully they will let me join. Holi–I had no idea what this was until today. I will say that I was warned by everyone in the office not to go out or I would be hit by water balloons, shot with water guns, and have colored powder dumped on me. Waking up this morning I didn’t think much about it, but Mike my flat mate was already gone. Thinking that he had some inside info, I hurried to get to the office before the celebrating began. The ride to work was the most pleasant of my stay here, few cars on the street, less smog, fewer people, etc. Arriving in the office, I joked with Mike that everyone had overblown the extent of this celebration. 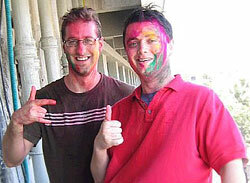 Fraser (the head of the office here) would not let us be in India without, as he said, getting a little color. Here is the outcome. I am waiting at the office for a videoconference, looking forward to the reaction of my clients in London, when they see me covered in color. The security guards in the office are having a great time laughing at the foreigner who now has a little color. I finally was able to go out on my own yesterday. Since I arrived, everyone has been great, taking me to lunch, driving me home, helping me buy a phone, etc. So it was nice to just walk around Bandra for a couple of hours and see if I could make it home all by myself. I will say that it was different being alone, I was much more aware of what was going on around me especially when I was “attacked” by a gang of Indian kids. Attacked is a strong word, but it was the first real shock of the trip. While standing at a corner trying to figure out how I was going to get home and looking completely lost, I was suddenly hit by about a cup of water. It only hit my leg so I didn’t really think much of it. When the next water balloon hit my hip, I started to think, Does the flight leave for D.C. at 10 or 11 A.M.? Once I heard the laughter of children, I understood that I was just the subject of their good fun. I finished my walk home feeling proud of such a small accomplishment. Sunday night I finally met some people outside of work. The two girls among the group who I had some association with have a company called Diva Make-up that does make up on “Bollywood” movies. I felt like I had it easy when I arrived compared to their journey. I was picked up at the airport, shown a place to live, given a desk at work, and basically cared for. Virginia and Lindsey essentially came over here and figured it out on their own, so while I might be adventurous, I am not in the same league as a lot of people. Anyway, I had dinner with them, talked about the culture shock that I am supposed to be going through, the war (not something I tend to ever bring up), life in Mumbai, differences between here and the U.S., etc. It was nice to finally talk about something other than project plans, testing resources, JAVA code, and delivery dates. I also had my fortune read with tarot cards, the end conclusion is my past was not that great, but the future is looking bright. Lindsey started to read more into it, but I felt that I should leave it simple. Friday night was spent with some of the guys from the office at Janta, which was described to me as a bar. It was more like the Indian version of the “He-Man Woman-Haters Club.” Basically this was a room of tables for men to sit around, smoke, and drink. Not only were there no women in the bar, but no woman had ever even thought of going there. Otherwise, it was basically the same experience you have anywhere, coworkers sitting around griping about work and making fun of each other. I went home early. Saturday, was my first trip to South Bombay. The purpose of the trip was for me to go sailing with some guys from the Royal Bombay Yacht Club but this didn’t go so well, because we were a little late getting started, so I didn’t make the start of the race. I did get a tour of the yacht club and it is very nice–exactly what I would imagine from a club built by the British over 150 years ago. I am supposed to talk to the commodore of the club next week about membership and racing in their J-24 match race next weekend. Hopefully this will work out and I will be sailing soon. We had lunch at Leopold’s, a well known dining spot in Bombay. I could tell that this was more of a tourist spot than Bandra, many more western people walking around. Didn’t do much Saturday night other than cook up some sausage and eggs to get my stomach back on track. So I went out for the first time last night, a place called Olives – basically the “Daily Grill” [Washington, D.C. restaurant] of Bandera (this is the pop.1,000,000+ suburb that I live in). As Rakshit (a friend of mine from work) said, this is not India. Other than everyone being Indian, it could have been any bar in the U.S., except I only spent $10 for five drinks and was “angry” that it cost so much. When I arrived in Mumbai Sunday at 2 A.M., the only way the guys from my office found me was to look for “the guy who looked the most lost”–that was me. After a nine-hour flight from London with a horrible hangover, sitting next to a smelly Frenchman who knew nothing about arm rest etiquette, I was ready to be anywhere but on that plane. My stay in India started with a very traditional Indian cultural event, drinking beer until 5 A.M. Saturday was rather simple, wait for someone to pick me up, get lunch, buy a mobile phone, have dinner, and sleep. Since Sunday, I have done nothing but work and sleep (my priorities are out of whack). If you want my initial opinion of Mumbai (otherwise known as Bombay), it is exactly what people told me. Bigger, dirtier, more polluted, with more people than any city you have ever visited. What nobody told me what that it is inhabited by mad rickshaw drivers who drive right at you before swerving at the last minute. Stores smaller than a 7-11 have more stuff than a Super Wal-Mart. When you try to do things like get your own water in the office, people look at you as if you’re mad. Finally and most importantly, the people here put “Southern hospitality” to shame. Nobody will let me eat alone, much less take a rickshaw home alone. All in all, the first couple of days have been sensory overload, but I think it is going to be fun (if I can get away from work).